Are you interested to learn about one of the United States more recent presidents, Bill Clinton? He was born on August 19, 1946. His birthplace was Hope, Arkansas. Clinton lived in Little Rock with his family. Clinton was baptized at Park Place Baptist Church. His father died in a car accident three months before he was born. His last name was originally Blythe. His full name is William Jefferson Clinton. He took the name of Clinton while he was in high school because Roger Clinton was his stepfather. His mother's name was Virginia Dell Cassidy. His mother was a nurse. He has one brother, Roger Jr., who he pardoned for crimes while he was in office. When he was in high school, he played the saxophone in a jazz trio known as the "Three Blind Mice." He continues to enjoy playing the sax. He was an extraordinary student. He attended Georgetown University and graduated in 1968. He went on to Yale University Law School, from which he graduated in 1973. He was a Rhodes Scholar at Oxford University. In 1974, he was a first year law professor. He became the governor of Arkansas when he was 32 years old. He was the youngest governor at the time in the United States. The Clintons lived in the Arkansas Governor's Mansion for 12 years. Bill Clinton won 43% of the vote the first time that he ran for President. He was 46 years old when he was inaugurated. He was the third youngest President of the United States. Clinton was the first elected President of the United States to be impeached. The impeachment occurred in 1998. He was impeached due to lying about his affair with White House intern Monica Lewinsky. Clinton was the first two term Democratic President since Franklin Delano Roosevelt. Although he was a Democrat, Clinton was more moderate in his policies than other Democrats have been in the past. Some people have categorized a few of his policies as being centrist. On his last day as the President, he gave 140 pardons. People see his healthcare plans as his biggest failure. He identifies as a Baptist, which is a type of Christianity. He is 6 foot, 2 inches tall. His wife is Hillary Rodham Clinton, who is also a well known name in the political sphere. He is still an active public speaker. These facts were selected to provide the most important facts about Bill Clinton. "What Are Some Facts About Bill Clinton? ." YourDictionary, n.d. Web. 22 April 2019. 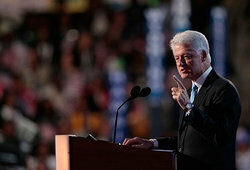 <https://biography.yourdictionary.com/articles/facts-about-bill-clinton.html>. Which Presidents Were Left Handed?